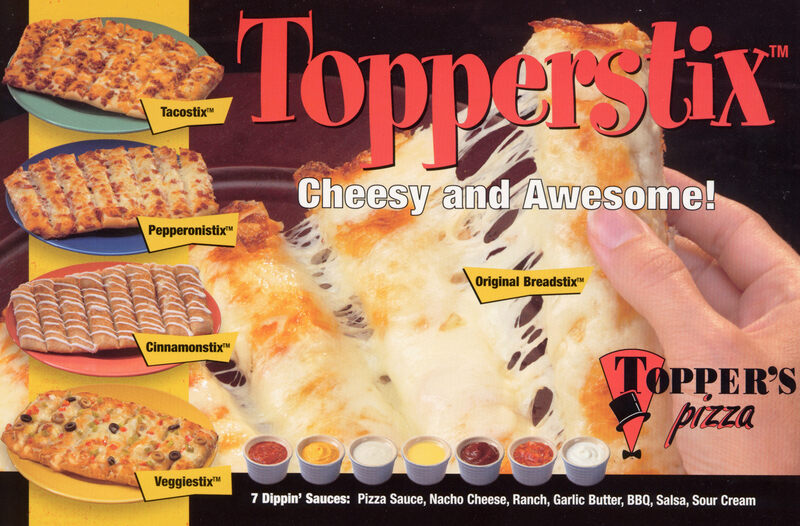 The first Toppers Pizza store opened on August 9, 1991. My then wife Carol and I had lived like paupers for about 8 years saving nearly everything we’d made working like dogs. We had saved $30,000, which I still have a lot of pride about. We had a dream to own our own restaurant that drove us to do something most people in their 20s have trouble doing: spending less than we made and saving. The founding vision of Toppers was to be THE quality pizza delivery place. We would make our dough from scratch, use great ingredients, and make funky combinations of pizzas using cool toppings (therefore the name “Toppers”), but we would deliver just as fast as the fast food pizza joints that made crappy pizza. We opened up that first store doing what qualified as big sales then, about ten or twelve thousand dollars a week. In October I took my first day off; I remember it well. I woke up and it was dark outside. I didn’t know if it was the next night or the next morning. Carol was working of course, and had our truck of course. Thankfully it was only the next night so I got up and walked about a mile to a McDonalds to eat. I walked back. I went to bed. Day off. In November we had almost $30,000 in the bank! I was sure we had “made it” and I’m pretty sure those are the words I used at the time. Heck, we’d already made our money back! I drove around the Midwest one week scoping out our next location. I went to several Big 10 college towns, ate pizza and judged the vulnerabilities of the people that seemed to be selling all the food. We hired another assistant manager to train up for the upcoming expansion. Christmas week we did $700 in sales. Yes, for the week. By the second week of January I had called our landlord and food vendor and told them I was a little behind and would send them their money as soon as I could. I made the tough decision to let the assistant manager go. We were broke. That was really when my education in the pizza business started in earnest. Up until then I’d never been scared. At times it can be scary to lead. For more on the subject, check out “Why You Must Embrace the Danger of Adventure to Lead Effectively“, by Matthew Gonnering. Matthew is the CEO of Widen, a fast growing Madison, WI company. Even though our businesses are quite different, I have learned a lot from Matthew. What I didn’t tell you is that we opened up with an aggressive special that we promoted with flyers all over campus: $3.99 small one topping pizza. Second one for $1.99. Now, that wasn’t as cheap then as it sounds today, but it was cheap. Too cheap. Selling good food for that price was a big Ponzi scheme. As long as our sales went up, we could pay our bills from the prior weeks, but as soon as sales dropped we were in trouble. We survived and struggled through 1992 in part by selling 20% of Toppers Pizza to my Uncle Mike for $15,000. It wasn’t worth that much, and I thank him for giving me that charity. (I later bought it back from him when it still wasn’t worth a lick.) In early 1993 a friend of mine in the pizza business called me up and told me that I should open a second store in Whitewater, Wisconsin. I told him that I probably didn’t have enough money to buy a bus ticket to wherever Whitewater, Wisconsin was, let alone open a pizza store there. He told me that it was already a set up store and that he would sell me everything on contract. I scraped together that bus ticket money and went. Seriously, I went on a bus. I painted a logo on the side of that building in Whitewater and opened up in March, 1993. Toppers: take two. Another chance to do it right. Our prices were about double what they were in Champaign. We distributed flyers all around Whitewater, just like we had in Champaign, but this time those flyers were menus, not cheap pizza coupons! Over the next 2 years Toppers in Whitewater became known as THE place to get great pizza and cheesy Topperstix, all day and all night. We sold the store in Champaign and it later closed. Today when people ask me where Toppers started, I almost always say “the oldest Toppers Pizza store is in Whitewater, WI”! February 29th is a Tuesday.